fice in Manila to facilitate marketing, promotion and to handle orders here locally and abroad. Health benefits Organically-processed and with low glycemic index of 35, Lao claimed that coco syrup and sugar are safe for persons with diabetes, hypertension and goes well for the health conscious individuals. The index is a measure of the effect of carbohydrates in the personâ&#x20AC;&#x2122;s sugar level and the tolerable level is below 100. Lao personally attests to the efficacy of the coco sugar, saying that constant use has lowered hypertension incidence. His neighbors and other regular users of the coco sugar from the other barangays in Bansalan have also expressed similar accounts. “My blood pressure has become stable, and I’m not taking medicines anymore,” he said. Lao also discloses that Southern Philippines Adventist College in Matanao, Davao del Sur is conducting a study on the therapeutic benefits of coco sugar and syrup among diabetics and hypertensive persons. concept in the production of coconut sap-based products like coconut sugar and coconut syrup, Lao also began producing cacao with coconut sugar, ginger brew (salabat), and sweet and spicy seasoning. technology is also considered environment-friendly, with the VerusUSA issuing the certification that the plant is carbon-neutral. “The trees surrounding the plant have also helped lessen the carbon emission,” he stated. Further, the farm’s seasoning product made of coco sugar and syrup with vinegar is Halal-certified, Lao said. the Outstanding Organic Farmer. He also received Presidential trophy and citation with a cash prize of P100,000. Lao bagged his first national Gawad Saka award as the Outstanding Coconut Farmer that earned him a P120,000 cash prize. 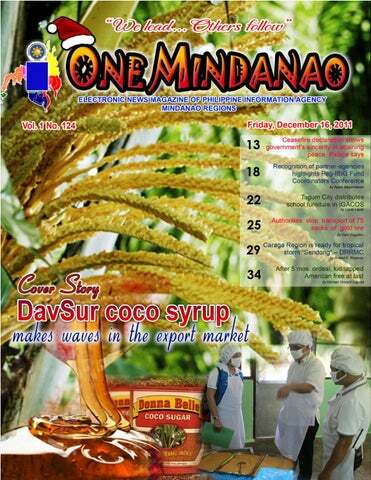 He invested it construction of a mini-processing plant for the coco sugar and coco syrup products. tributes from time to time. a hindrance to dream big and strive hard to bring farm products in the export market, and compete globally,â&#x20AC;? Lao expressed. Lao said he would expand his export market to Germany and other European countries by February next year. He said that negotiations with Japan buyers are going on. resident Benigno S. Aquino signed into law the P1.8-trillion General Appropriations Act for 2012 in ceremonies held on Thursday in Malacañang. Fires caused by firecrackers rising –-- BFP by Phres A. Evardone ires caused by pyrotechnics are on the rise based on data from the Bureau of Fire Protection (BFP), according to Superintendent Joselito Cortez, OIC of the Directorate for Operations of the BFP. going around communities to explain safety tips, using a public address system. Cortez was the guest at the program “Talking Points” aired over People’s Television (PTV-4) and Radyo ng Bayan, and sponsored by the Presidential Communications Operations Office and the Philippine Information Agency. gencies who were supportive to the programs and projects of the Home Development Mutual Fund, otherwise known as the Pag-IBIG Fund, were given plaques of recognition by the Pag-IBIG Fund - Cagayan de Oro Branch. Economic Research and Assistance Center (NERBAC) and the Cooperative Development Authority (CDA), as well as, the city government of Valencia and the municipal government of Gitagum. Meanwhile, Pag-IBIG Fund Cagayan de Oro Branch Department Manager III Juliano Banghal, said updates on the latest programs implemented by the Fund was also be tackled during the FC club conference. These include the online registration for employers and members, LandBank cash card and e-collection, among other programs and services. The FC Club conference is part of the many activities lined-up during the month-long celebration of Pag-IBIG Fund 31st anniversary. ILIGAN CITY, Lanao del Norte — The Department of Energy (DOE)Mindanao Field Office (MFO) has organized and sponsored the Energy Industry Consumers Empowerment Seminar in selected cities in Mindanao, including Iligan City, December 12. The activity was in coordination with the Department of Trade and Industry (DTI), Lanao del Norte Provincial Office. We conceptualized the activity based on the key policy area of the national government which underscores “Energy Access for More” as the guiding vision to mainstream access of the greater majority to reliable and affordable energy services, said Edmar A. Derla, assistant chief, Energy Inspection and Monitoring Division, DOE-MFO, who represented Director Manuel M. Llaneza, DOE-MFO, based in Davao City. In celebration of the National Energy Consciousness Month in December, DOE has attuned and harmonized the (topic) presentations with the chosen theme, “Bright Now! Do Bright, Do Right,” which is aimed at empowering and enhancing the level of awareness and consciousness of the consumers on the different energy services. Speakers presented and discussed the household energy conservation and efficiency tips; fuel safety and ‘tipid’ tips; salient rules and regulations of DOE and DTI; Basic Consumer Rights and Responsibilities; updates on Mindanao power situation, including pertinent issues and concerns that are currently confronting the energy industry. plications to run ball mills has also increased after Gov. Pingoy ordered dismantling of illegal gold ore processors in the area. Pingoy has given ball mill operators in mining areas until January 15 to secure permits from the provincial government, Flaviano said. sa tubig, mubalhin na dayon sa labing safetly nga lugar,” Posas said. (Those who are living near water systems must be watchful at all times. If water level is rising, they must leave the area and secure to a safer place.) 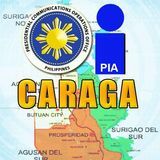 The official also advised fishermen to temporarily cancel fishing activities while the typhoon is approaching the coastal areas in Caraga Region this afternoon. Travelers are also advised further to postpone the trip. In a related development, morning flight of Cebu Pacific bound for Metro Manila has been cancelled as of 10 am. Since last night, most parts of the region have been experiencing continuous light to moderate rains. SURIGAO CITY – The provincial disaster risk reduction and management council (PDRRMC) in the province convened today to prepare for Tropical Storm “Sendong” which is expected to make a landfall early this afternoon over Davao Oriental. BUTUAN CITY – As public storm signal no. 2 is raised in Agusan Del Norte, around 100 passengers are stranded at the Nasipit port in Agusan del Norte due tropical storm Sendong. Under Storm Signal No. 2, no vessel will be allowed to travel. Stranded passengers are being accommodated at the passengers’ port terminal, according to Armando Balbutin, clearing officer of the Nasipit Port, in a radio interview this morning. Meanwhile, PAGASA also warns Agusanons to take precautionary measures as ‘Sendong’ is expected to landfall this afternoon. Dinagat Province, Agusan Provinces, Misamis Oriental, Camiguin, Bukidnon, Davao del Norte, Compostela Valley, Samal Island, and Davao Oriental. While the areas of Sorsogon, Ticao Island, Masbate, Samar Provinces, Biliran Island, Panay Island, Guimaras, Negros Provinces, Cebu, Siquijor Island, North Cotabato, Northern Davao del Sur, Lanao Provinces, Misamis Occ., Zamboanga Provinces are under signal no. 1.
evin Eric Lunsmann, the 14-year old FilipinoAmerican, is free at last after 5 months of captivity in the jungles Basilan. DOLE-9, LGU-Isabela distribute Kabuhayan by Rene V. Carbayas starter kits ISABELA CITY – The Department of Labor and Employment in Region-IX and the local government unit of Isabela City recently distributed Kabuhayan starter kits to some 78 beneficiaries in the city. regular program of the Kabuhayan starter kit and 18 are people with disabilities (PWD). The number was intended to commemorate the 78th founding anniversary of DOLE this year. He told beneficiaries that “it is in their hands” and all now depends on them and their passion to grow their business and the livelihood assistance given to them by DOLE. delivery, distribution, and transportation of dangerous drugs, controlled precursors, and essential chemicals” is punishable with life imprisonment. The suspects are also liable for violating Section 11, or illegal drug possession, also punishable with life imprisonment, Albani added. Dir. Albani proudly said that his office has the highest number of cases filed nationwide, resulting to convictions. “Dito, may convictions tayo, at hindi ito gaya ng dati”, pointing to the 15 sentenced violators.